Raksha Mantri Smt Nirmala Sitharaman today inaugurated the 426.60 metre long Pre Stressed Concrete Box Girder type bridge over Diffo river on Roing-Koron-Paya road in Arunachal Pradesh. Dedicating the bridge to the nation, the Raksha Mantri praised the commendable work being done by Project Udayak, Border Roads Organisation (BRO) in this region. 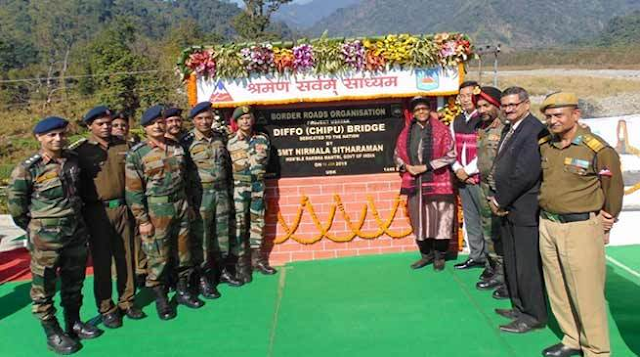 Smt Sitharaman appreciated completion of this prestigious bridge which would provide uninterrupted access between Dibang valley and Lohit valley region of Eastern Arunachal Pradesh and an all-weather Road to the troops deployed on the China Border. Director General Border Roads Lt Gen Harpal Singh explained the rigours/hurdles faced by BRO in tough working conditions in an almost inhospitable terrain facing turbulent flash floods and also pointed out that the BRO has sacrificed numerous precious lives in discharging its duties across the length and breadth of country.